Here she be, sorry for the wait! I've been trying think of things to knit during the summer while laying out next to the pool. This seemed like a good thing to do. Plus, I have a crocheted one, but what if some of you don't crochet? It knits up in about 4 hours, less if you are super fast, and only takes up about a 2 oz ball of yarn. Plus you can use your cutest buttons for it. Oh and because of all the yo's you can adjust the size pretty easy. I've made about 5 to get the pattern A okay, but wouldn't you know I neglected to leave on in tack! Sometimes my lack of foresite amazes me! 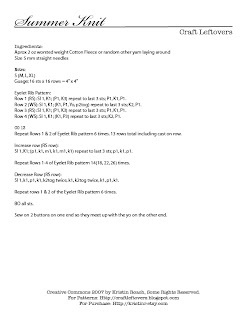 So here is the pattern, and I will post a picture when I get off work tonight. Oh and when I get the picture I'm going to put it into pdf format to and you will be able to download it by clicking on the link. Download the pdf here: Summer Knit Head Wrap (pdf) Talk to you soon, have a good day! Any chance of posting the crocheted one too? I've actually been thinking about it making a crocheted one too. It is in the works! There is the crocheted head wrap from the spring time that I did a couple of months ago that just ties in the back. It doesn't have any shaping or buttons though. Heck maybe that could be next week's pattern. Thanks for the feedback! That one is cute too! I'm looking for something like this for a project I want to work on for someone I know...thanks! !